1) Keep fork slider clean. Any dirt on the fork slider could wind up inside the fork. 2) Keep dust seal clean. 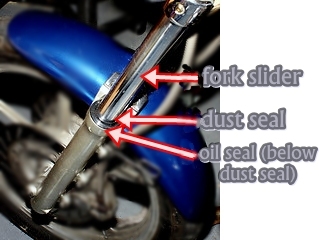 If dust seal has cracks, dirt could get into the fork. In many cases of fork seals leaking, the seal does not need to be replaced – it just needs to be cleaned. Pull up the dust boot, and, using a 35mm film negative or piece of thin flexible plastic about 0ne inch wide and maybe 2 1/2 inches long (13 mm x 64 mm), slide the plastic piece down the fork leg between the seal and the fork slider. Once you learn to bend the plastic to make a contour that fits the fork slider, it is easy to do. Moving the plastic piece up and down, go completely around the fork slider a few times. It should go to a depth of about 1/2 inch or 13 mm. Doing this removes the dirt trapped between the fork seal and the fork slider, and, in many cases, will stop the fork seals from leaking. My Honda CM400 fork seals were leaking badly, and this totally fixed it. You sent me over 100 emails. Why did you do that ? I have a 250 Virago and would like to change the forks to longer ones to lift the bike up a bit at the front. Any suggestions on forks that would fit the 250. Thank you for your reply ‘re.virago forks.